Gov. Andrew M. Cuomo announced that American Airlines and British Airways will invest $344 million in John F. Kennedy International Airport to expand and improve the customer experience at Terminal 8 as part of the Governor's comprehensive plan to make the airport a modern, 21st century gateway to the nation. 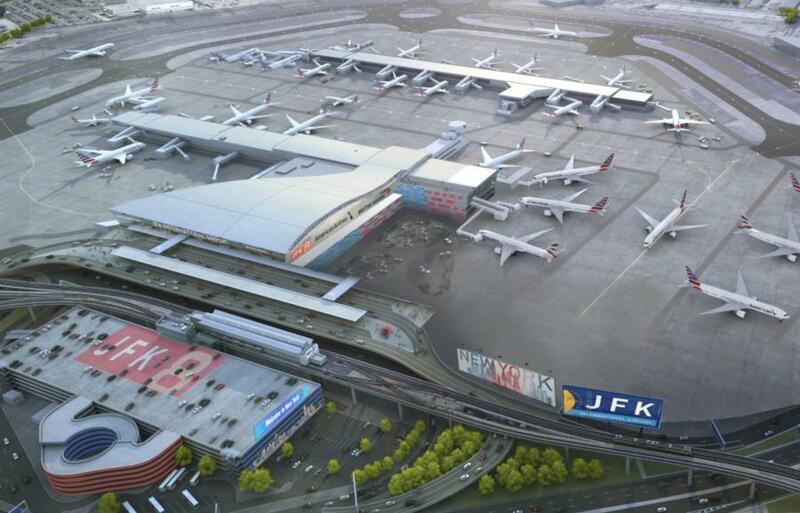 "Only four months ago, we announced plans to transform JFK Airport into a state-of-the-art global hub, with new and unified terminals adding 4 million square feet and increasing the airport's capacity by at least 15 million passengers annually," Cuomo said. "Today that transformation is well under way, with an extraordinary private investment that will turn JFK into a truly modern airport. This new investment is part and parcel with the state's broader efforts to modernize airports all across New York. From JFK and LaGuardia to Ithaca and Rochester, we are making historic progress rebuilding our airport infrastructure for the future and ensuring New York State remains the nation's front door." "This significant investment continues our efforts to expand and modernize services at JFK Airport," said Lt. Gov. Kathy Hochul. "The project will create new jobs and new opportunities for thousands of New Yorkers, and continue to grow our state's economy and attract more visitors. This transformation of JFK and other airports across the state will ensure easier and safer travel and enhance the overall experience." The Terminal 8 enhancements will be made pursuant to an agreement between the Port Authority and American Airlines over the next three years in preparation for British Airways moving from its current location in Terminal 7, which will be replaced as part of JetBlue Airways' plan to build a new terminal on the airport's north side. No Port Authority funding is being committed to the Terminal 8 upgrade. This announcement is the latest step in Cuomo's sweeping $13 billion vision plan for the future of JFK unveiled in October 2018. This record investment, 90 percent of which is private funding, calls for a unified and interconnected airport featuring two new international terminals with state-of-the-art passenger amenities, convenient ground transportation options, and vastly simplified roadways that will increase the airport's capacity by at least 15 million passengers per year. The American Airlines and British Airways investment in Terminal 8 will improve the overall customer experience, with a total of 70,400 sq. ft. of added space including 33,000 sq. ft. of public space. Another 57,500 sq. ft. of existing space will be refurbished. New amenities include premium lounges for both airlines, enhanced baggage systems, premium check-in space and upgraded concessions. Port Authority Executive Director Rick Cotton said, "American Airlines and British Airways have joined the extraordinary efforts under way to make John F. Kennedy International the world-class airport our customers expect and deserve. This is a turning point in JFK's history. We are responding to record numbers of passengers with record levels of infrastructure investment. We also will ensure best-in-class customer service is part of these initiatives, as work begins on transforming JFK into a worthy gateway to the United States." As part of the implementation of the JFK vision plan announced last October, JetBlue is constructing a $3 billion, 1.2 million sq. ft. new terminal on the airport's north side that will connect to the airline's existing Terminal 5. Additionally, another new $7 billion, 2.9 million sq. ft. terminal on the airport's south side will occupy the area where the existing Terminals 1 and 2 are located. The new south side terminal will be developed by the Terminal One Group, a consortium of four international airlines — Lufthansa, Air France, Japan Airlines and Korean Air Lines. Collectively, these necessary changes will increase the airport's capacity by at least 15 million passengers a year. Additionally, modern technological improvements will be included as part of the terminal upgrades. The New York State Department of Transportation will improve highways leading to/from JFK, while the Port Authority will invest in on-airport roadway improvements to simplify the existing spaghetti-like loop roads. The Governor last fall announced the creation of the JFK Redevelopment Community Advisory Council, composed of elected officials, community boards, nonprofit organizations, civic organizations and clergy leaders. The Council is chaired by Queens Borough President Melinda Katz and U.S. Congressman Gregory Meeks, and works with the Port Authority to expand community outreach efforts that are already under way, ensuring JFK's ambitious projects solicit ongoing feedback from local stakeholders as well as providing meaningful opportunities for local businesses, MWBE businesses and jobseekers. This includes a commitment to the Governor's nation-leading goal of 30 percent utilization of MWBEs. A community office for the project will open in Jamaica, Queens, providing easier access for firms looking for business opportunities as well as local residents in search of jobs.